HOUSTON — First things first: The Minnesota Timberwolves are not merely happy to be in the playoffs for the first time since 2004, despite the prevailing narrative regarding their presence. The circumstances certainly allude to a measure of complacency on behalf of the Timberwolves, who claimed a winner-take-all showdown with the Denver Nuggets on Wednesday to end the longest postseason drought in the league. 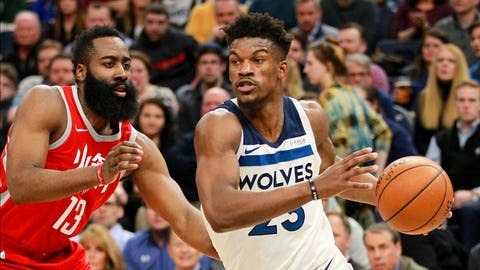 For their effort, which included surviving a lengthy span of the stretch run without All-Start guard Jimmy Butler, the Timberwolves earned a matchup against the top-seeded and heavily favored Houston Rockets, with their Western Conference first-round series set to commence Sunday at Toyota Center. Given the long odds, and the fact that Minnesota hasn’t won a playoff series since the 2004 Western Conference Semifinals, is drawing Houston accomplishment enough? “We expect nothing but greatness from ourselves,” Timberwolves center Karl-Anthony Towns said. “We didn’t wake up this morning like, ‘Hey, we’re going to go to Houston.’ We woke up saying we’re going to go to Houston and get the job done. We put pressure on ourselves because we want to be so great, we want to be the best team possible that we can be. I think we’re going to do fine. The Timberwolves will have to circle the wagons against an opponent that blitzed them four times during the regular season. The Rockets claimed the first three meetings by 18 points each and led by 25 in a 129-120 road victory March 18. Houston, the most prolific 3-point shooting team in the league by volume, hit 69 of 159 3s in those four games for a robust 43.4 percent. How Minnesota handles the challenge that comes with defending the Rockets might align with its offensive approach. By relying on Towns, who paced the team in points (1,743), rebounds (1,012), blocks (115) and 3-pointers (120), plus Butler in the post, Minnesota might unlock a pace that could prevent Houston from its usually lethal combo of layups and open 3s. Matching the Rockets offensively might be as sound a strategy as anything the Timberwolves can muster defensively. Houston not only made more 3-pointers (1,256) than any team in NBA history, the Rockets actually attempted more 3s (3,470) than shots from inside the arc (3,446). Additionally, Rockets guards James Harden and Chris Paul ranked first and fourth, respectively, in isolation points per possession. And for added measure, center Clint Capela paced the league in field goal percentage (65.2), gorging on a healthy portion of lobs courtesy of the penetration Harden and Paul created by opponents scrambling to defend the 3-point arc. The Timberwolves finished 23rd in defensive efficiency during the regular season, so any expectation that they might lock down the Rockets this series is foolhardy. The Rockets are well aware of their potency, and the potential to inflect damage by doing what they usually do.